As a passionate advocate for her language, Hawaiian, or rather, ‘Ōlelo Hawai‘i, @aloha_aina took part in the 2018 #MemeML challenge. She published several memes infused with Hawaiian wisdom called ‘ōlelo no’aeau, “poetic sayings”, many of which were collected by the famous Hawaiian scholar Mary Kawena Pukui. She shares a little more about her language and her participation in the challenge with Rising Voices. Rising Voices (RV): Could you tell us a little bit about your language? While ‘Ōlelo Hawai‘i is one of the two official languages in Hawai‘i – it is still a language under siege. After the overthrow of the Hawaiian kingdom in 1893, the new American government tried to eradicate ‘Ōlelo Hawaiʻi by outlawing “education through the Hawaiian language.” Schools used to be “English Standard” where, even through my grandparents’ time, children were beaten for speaking Hawaiian. Typically, people in my parent’s generation were not taught to ‘ōlelo (speak Hawaiian). Thus, after nearly 100 years, it seemed the drive to extinguish the Hawaiian language was successful. However, as the civil rights movement grew on the mainland, many Hawaiians took up the cause to fight for their rights, culture and language. With the public revival of such cultural activities as mele (poetry and song), hula (dance) and lua (Hawaiian martial arts) – all of which survived intact behind closed doors – ‘Ōlelo Hawai‘i began to rebound. Many ‘Ōlelo Hawai‘i champions came forward to teach openly. Because Hawaiian is a language of kaona (hidden meanings and poetry), mānaleo (native speakers) were found to help bring back not only the language, but the thought behind the words. In 1978, the state constitution was revised to make ‘Ōlelo Hawai‘i one of the state’s two official languages along with English. However, the law banning instruction in the Hawaiian language was not repealed until 1986. RV: What is the status of your language online and offline? While great strides have been made to revitalize ‘Ōlelo Hawai‘i, we still have much to do. Just last month, a judge held a man in contempt for speaking Hawaiian in court. We also have the problem of a generation of speakers speaking what has come to be known as “University Hawaiian” – basically English translated into Hawaiian, devoid of a Hawaiian cultural frame of reference. Thankfully, there are still kūpuna (elders) and kumu (sources or teachers) who continue to guide us and advocate for our language and culture. Theyʻve help to create great online resources like ulukau.org (a repository of Hawaiian reference materials) and wehewehe.org (a collection of Hawaiian – English dictionaries). RV: Why did you decide to participate in the challenge, and what was your inspiration for these poetic memes? I love that you are celebrating indigenous languages and giving people a forum for expressing themselves in their native tongues. It’s wonderful to get a glimpse of other people’s cultures through their languages. And, it’s exciting to think how online forums like Rising Voices can help perpetuate those cultures. As for the topics of the memes I posted, I tried to nānā i ke kumu (look to the source) and share something beyond what I could come up with on my own. 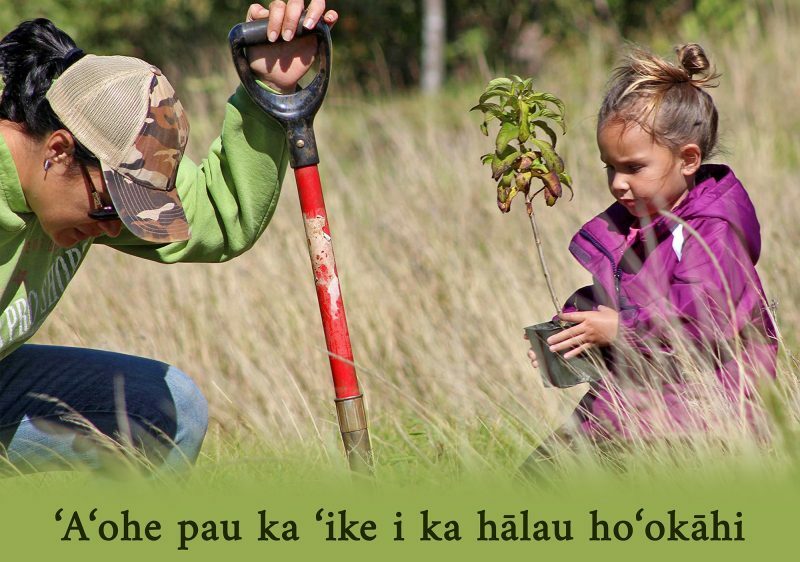 Many of the phrases are well-known ‘ōlelo no‘eau (poetic sayings). RV: Who would you like to challenge to create a meme in their language? I would like to encourage everyone who speaks a native language to post in your own language and to perpetuate that language on and offline. To my Hawaiian community: E ala e. E ho‘omau kākou. Rise up. And, persevere.